We want YOU to join us! Throughout the week, FI2020 Week partners will hold webinars, public events, and online conversations – an opportunity for you to join in a variety of interesting conversations. The conversations cover a full range of topics, from client protection in mobile money use, to incorporating financial capability into product design. Follow #FI2020 on Twitter or check out our Storify feed for the latest updates. We want to know what you believe is an important action needed in your country or industry segment to advance financial inclusion. Add your thoughts by emailing Allyse McGrath at mcgrath@accion.org or share your thoughts on Twitter using #FI2020. Read what people have been saying so far. How is the world doing on financial inclusion? We rated progress in five key areas on a scale of 0-10. Disagree with our findings? We want to hear from you! 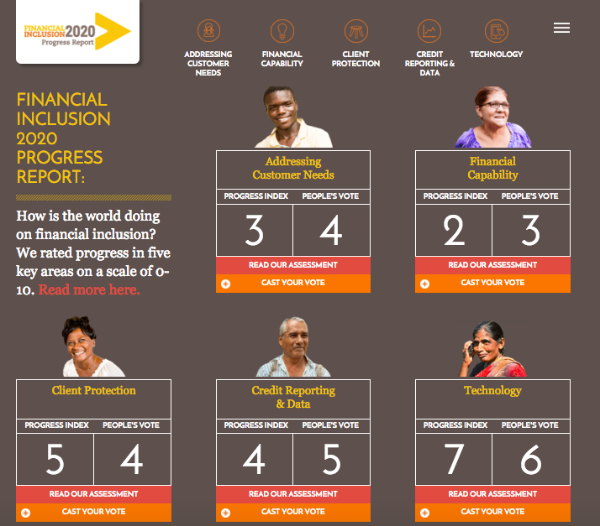 Add your vote on the FI2020 Progress Report website. Faith and Finance: What can we gain from interest free lending? This panel will explore the opportunity to further access finance through interest-free lending. Both the Jewish and Muslim faiths follow similar religious tenets in not accepting interest payments while making loans to the poor. These centuries-old practices are playing an increasingly important role in today’s microfinance market. This event will provide an overview of the roots of interest free-lending, the financial structure of interest-free micro-loans, organizations that follow these practices, the investment proposition, regulatory considerations, and barriers and opportunities for growth. The World Savings and Retail Banking Institute (WSBI) is one of the Coalition of Partners supporting the goal of Universal Financial Access (UFA). This webinar will focus on the lessons drawn from a six year project (2009 – 2015) carried out with 12 WSBI member banks and aimed at creating usable savings services in the hands of the poor. If you use Internet Explorer or Apple Safari, you’ll need to install the BT MeetMe video client. This session will discuss how the GSMA – the global association for mobile network operators – is working with its members to ensure that mobile money services are safe, reliable, and secure, and that customers are treated fairly. The Code of Conduct for Mobile Money Providers includes eight high-level principles addressing topics such as safeguarding customer funds, AML/CFT, training and monitoring of staff and agents, reliable service provision, security, and fair treatment of customers. This session will provide a brief background to the Code of Conduct initiative and outline the plan for implementation of the Code. It will be useful for regulators, financial inclusion specialists, consumer protection advocates, and any other stakeholders who are interested in understanding what mobile operators are doing to ensure the safety, reliability, and fairness of mobile money services. Mobile money services are expanding across developing and emerging markets. In 89 emerging markets, 261 deployments serve 103 million active mobile money customers, who perform 717.2 million transfers and payments per month worth USD 16.3 billion. These figures highlight how pervasive mobile money has become and the potential it has to contribute to more efficient and inclusive financial systems. This webinar will explore how mobile money is driving financial inclusion and its positive impact on other public policy objectives. This webinar will reveal the results of a comprehensive study of gender and leadership in microfinance institutions in Latin America conducted by Andares and EA Consultants, and funded by the Multilateral Investment Fund (MIF) and Calmeadow. The webinar will aim to present a complete picture of the makeup of leadership at MFIs in Latin America and the barriers that women face, but also stimulate conversation about why it is important to have gender-balance and what initiatives can be done to foster greater equality. India is home to an emerging yet fast evolving financial services market, where digital platforms such as online banking, mobile banking, e-wallets, exist side by side with brick-and-mortar banking. A lot of interventions have been initiated in last few months including payment banks and small finance banks. The industry is in a state of flux and disruption in this initial phase of expansion, and concerted efforts are required by stakeholders to facilitate its growth in a secure and sustainable manner. This session will focus on the scope, opportunities and challenges in leveraging ‘digitisation’ to maximise the impact of access to finance on low-income households and micro and small enterprises in India. Why Should Microfinance Institutions be Interested in Digital Finance Services? In this webinar, MicroSave’s the Helix Institute will engage in a discussion with digital finance and microfinance experts around the globe to explore the opportunities available in microfinance institutions in the digital financial services (DFS) landscape. Accion’s Channels & Technology team will host a webinar discussing results of their Digital Field Application (DFA) Case Study, examining the business case, implementation process, and effects for three microfinance banks around the world. Additionally, the webinar will cover lessons learned from the DFAs reviewed which could serve as guiding principles for other financial institutions. Some important results from the use of DFAs in the study included a decrease in the loan turnaround time (TAT) at Musoni Kenya from 72 to 6 hours, and an increase in average loan officer caseload at Ujjivan of 134 percent. Innovations for Poverty Action will host a webinar to showcase the latest rigorous evidence on innovations in financial capability and financial services. Register now to learn about the latest insights from research on financial product design, product-related information, and financial education, featuring presentations by Tarek Ghani (Princeton), José Tessada (PUC Chile), and Marina Dimova (ideas42). AVAL is an Ecuadorian organization that specializes in promoting the financial capability of Ecuadorians. During 2015, AVAL conducted a study of the financial capability of persons with physical disabilities in Ecuador in partnership with the National Federation of Ecuadorians with Physical Disabilities (FENEDIF). During this webinar, we will share the results of the study which allows us to better understand the financial capability needs of this population group. * Next steps for the VoC project, including details on the second round of data collection in Peru! What data exists on demand for, and access to, financial (and other) services? What does the data say? What data do operators need to scale products that enhance customer value? What is missing? What steps can we take to address these gaps? Freedom From Hunger launched a social media powered conversation on the topic of financial inclusion and what it means for FSPs and NGOs working in francophone West Africa, a voice in the financial inclusion dialogue which is often left unheard. The video compiled responses which highlight perspectives of the different players in financial inclusion across Benin, Burkina Faso and Mali. Viewers of the video are encouraged to ask questions and propose other strategies that the speakers can take forward in their respective countries and organizations. MicroSave will leverage 18 years of working with an array of leading financial institutions and consultants across the globe to discuss and highlight how they have addressed customer needs. We will bring leading experts from banks, MNOs, MFIs and other financial institutions to reflect on their experiences (good and bad!) and offer their advice. Graham A.N. Wright, Group Managing Director of MicroSave, will moderate the discussion on MicroSave's acclaimed and remarkably-active LinkedIn Group during the week - starting on November 2.